How many famous people do you know who are born on January 6th? 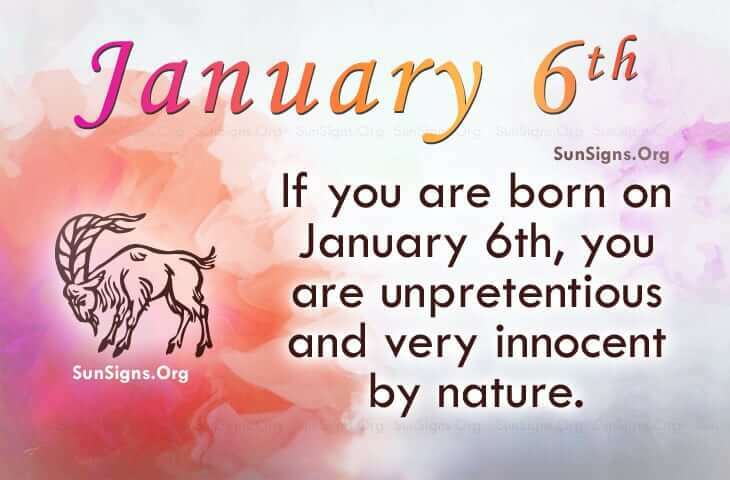 IF YOU ARE BORN ON JANUARY 6, you typically do not like chaos and will do anything to sidestep a hostile environment. As a strength and as a weakness, famous people born on January 6th are very “nice” people. Saying “no” makes them feel guilty but they may need to practice saying it from time to time. When it comes to careers of famous people born on January 6th, they probably love what they do. As a dedicated person, they have a tendency to throw themselves into work. As a reward, they own the best of the best and seek vacation spots that are only dreams to most. However, famous people with birthdays on January 6 are unpretentious and may find it hard to be governed by anybody’s rulebooks. They don’t share everything with everybody and this is a good thing. But when it comes to love, they may need to say how they feel instead of assuming someone knows their inner thoughts. No matter their age, there are some things that they remain green about. Famous Capricorns born on January 6 maintain healthy lifestyles. Those born on this day are likely to be understated artists whose creativity can be stifled. The personality of a Capricorn born on the 6th is one that is tender and joyful. Typically, they avoid negativity. Despite their best efforts, their birthday horoscope says they may be idealistic and perhaps, commitaphobic.